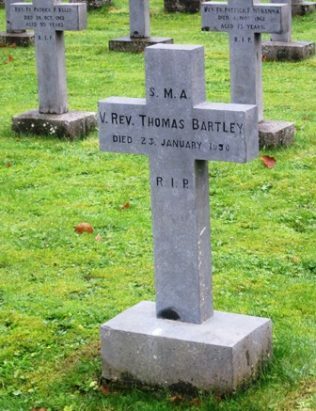 Thomas Bartley was born the 14th of July, 1897 at Brownstown, Hollymount, the youngest of eight children of Thomas Bartley Sr., a farmer from Brownstown and Catherine Hennelly, originally from Cloongowla, Ballinrobe. Like his other siblings before, Tom attended Ballygarries National School but then went on to receive a secondary education at Sacred Heart College in Ballinafad and later St. Joseph’s College in Wilton, Cork. When he made a choice to enter the priesthood, Tom’s decision to join the Society of African Missions may likely have been influenced by several priests before him who hailed from his home parish of Kilcommon and Robeen. Tom’s training was conducted at the S.M.A. Seminary at Blackrock Road, Cork and he was ordained a priest on the 11th June, 1925. 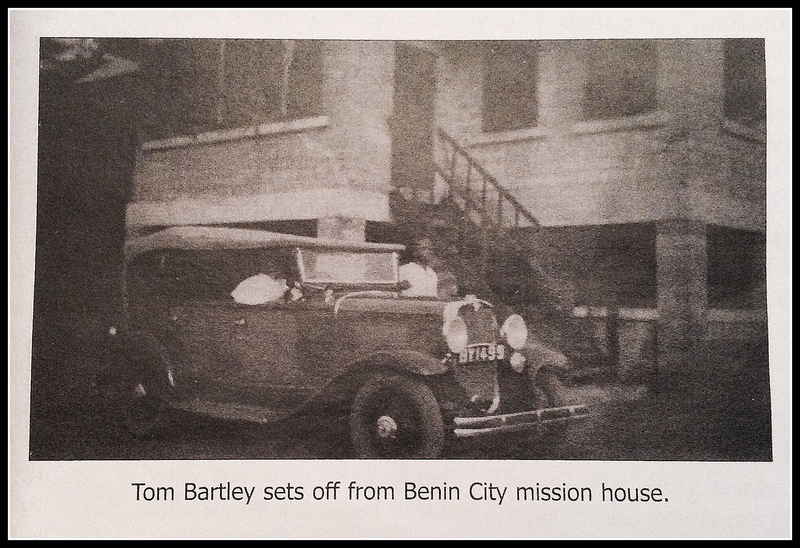 Tom was given a post in western Nigeria along with a few other fellow missionaries. They were tasked with establishing a base in Benin City for its first mission. A couple of years later Tom would receive appointments as a superior for a couple of outer districts where he strived to build and grow the order’s missions for a number of years. By 1935 Tom was made supervisor of schools which required frequent travel to the many remote outstations that had been established by then, from his home base in Benin City. Tom furthered his studies by returning to Ireland in 1937 to attend University College Cork as plans were being made by the order to expand and provide secondary education in Nigeria. Tom received a B.A. degree in 1941 and a higher diploma a year after while also fulfilling duties as a superior at St. Joseph’s in Wilton. His return to Nigeria in 1943, again as supervisor of schools, brought continued growth to the community. The administration of mission education was his primary duty while in Nigeria, but it was while on leave that he would work tirelessly to recruit medical professionals, teachers and religious orders for the Benin mission. He didn’t forget his people at home though. During the 1940’s when Robeen Church was undergoing a major enlargement with renovations, Tom secured a large donation of African sapele hardwood from a merchant in Nigeria to be shipped home to Mayo for use in the project. The doors and confessional boxes of Robeen church are just some of the lasting products of that gift. In 1952 Tom was appointed vicar general of the diocese of Benin City under Bishop Pat Kelly. In addition to the formal duties of running a very busy parish and his role in the administration of education, Tom was asked to supervise the building of the cathedral church of the Holy Cross in Benin City, which had become a diocese by 1950. The growth of the education system that occurred during his years was very sizable; there were over one hundred schools in sixty outstations with ten thousand students and five hundred teachers by this time. Tom travelled as much as fifteen hundred miles per month on outstation visits. Once the cathedral was finally erected and officially dedicated in 1955, he was due for a much needed rest. Tom was on leave in Ireland in 1956 when he died unexpectedly at the family home in Brownstown at age fifty-eight. He said mass that morning in Robeen and spent some hours with his sister and her family in Cornfield before returning to Brownstown. On previous trips home to Mayo, he also visited with his brothers and sisters, and his nieces and nephews, who all had great respect for him and were very proud of his many accomplishments. 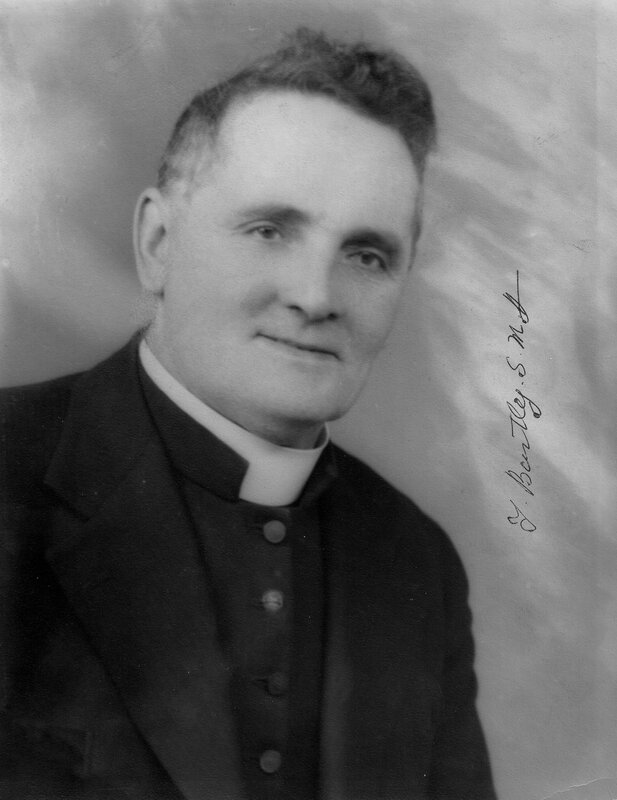 Two of his nephews, Thomas P. Bartley of Belfast (son of Tom’s brother Patrick- a teacher himself) and Thomas Mullaghy of Cornfield, Hollymount (son of Tom’s sister Delia) were inspired to follow in Tom’s footsteps and became priests and teachers as well. Fr. Thomas Mullaghy actually joined the S.M.A. order and spent many years in Nigeria, teaching and ministering there. Tom’s niece Mary Bartley, (daughter of brother James) had only graduated from nursing school in London with plans to spend time in Nigeria with her uncle when the news of his death halted those plans. Tom’s family was saddened by his death but his spirit lived on in the many recollections of his life that they shared over the years. Fr. Tom Bartley, S.M.A. helped to create for his religious community and the people of western Nigeria not only the structures and buildings that would support the growing population of Catholics there but a legacy of faith, education and leadership, the kind that leaves a lasting impression for generations. His family fondly remembers his life and his work.